Missouri River is the longest river in the U.S. and generally in North America. Her great length is 4130 km. Missouri is a tributary of the lower Mississippi River, and quite often the two water bodies are viewed as one river system, which has a total length of 6270 km. Missouri is a tributary of the Mississippi, and the second along its tributary after the Ohio River. It has a catchment area that covers approximately one sixth of the area of North America. River system Missouri - Mississippi is considered the fourth longest in the world. The river basin of Missouri covers about 1, 400, 000 sq. km. It rises in the east of the Rockies in the U.S. and the steppe region of the Great plains, flows through nine U.S. states and two Canadian provinces. Missouri River joins the Mississippi just above St. Louis. About 10 million people live in the drainage area of Missouri , concentrated mostly in urban centers in the southern basin of the river cities St. Louis, Kansas City, Omaha and Denver. One of the most beautiful stretches of the river and its tributaries is the border with Nebraska and South Dakota. The area of the river Missouri was settled with the Indian tribes as early as 12, 000 years ago. Native Indians of the region are the peoples of Mandan, Sioux, Hidatsa, Osage and Missouri in January (Missouria), and they inhabited the riverside of Missouri long before the Europeans came. Tribes of Missouri has as their godfather the river Missouri. French, Spanish and American explorers crossed the area of the river and conducted a study in 18 and 19 century. Missouri River plays an important role in the settlement and life of the West. Until the construction of railways in the late 19 th century it was mainly a means of transport in the region. In the 20th century, on the upper reaches of the Missouri were built six dams, that make it the largest system of dams in North America. The first settlers of the region came in the 18 century when in 1764 French fur trader Pierre Lakled based a trading colony in Missouri. 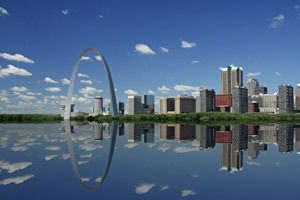 He chose the fertile area where the Missouri empties into the Mississippi and St. Louis city was named in honor of French King St. Louis. Fundamental to American history was 1803, when Frenchmen sold the city along with the entire state of Louisiana, USA. From there The state becomes a "gateway to the American West." As a monument to this great event in the city center was erected a huge concrete memorial, called the Gateway Arch. It reaches a height of 190 meters, and tourists climb to the top of it with 8 lifts. Today, in honor of the great explorers Lewis and Clark is built the homonymous tourist route (Lewis and Clark National Historic Trail), reaching lengths of 6000 meters, along almost all of the Missouri, from its source to its merger with the Mississippi. Opportunities for recreation along the river are many - there are special places for camping, fishing, hiking, canoeing in Missouri River, especially along the border with Nebraska and South Dakota.